A chambre d'hote (B&B) in the Limousin region, on the edge of the Massif Central and a day’s ride from the cross channel ferry ports. Set in enclosed, mature gardens the house is a three storey 100+ year old Manor house with varying accommodation; double, twin and triple rooms, some with en-suites and others share the house bathroom and toilet. A bar/games room, garden and lounge for relaxing in and evening meals available on request. There are plenty of local attractions and lots of green lanes around for those of you that are more adventurous. You can be in the mountains in an hour or on the beach in under three. Numerous rideouts are available, designed to cater for all levels of rider ability and experience. The routes are tailored to include the best roads, scenery and many local places of interest and can vary from short trips to full days. Free Wi-Fi. 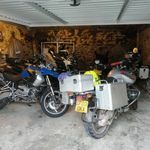 Drying room and Motorcycle washing facilities. Garaged parking. Expect a warm welcome, outstanding hospitality and extensive local knowledge, from British owners Rob & Mandy. A friendly place to stay, whether for a one night stop over or for a longer stay in the beautiful Corrèze region of the Massif Central. Catering exclusively for Biker groups, couples and solo riders, with clean, comfortable accommodation in en-suite doubles and twins, plus a Club room that sleeps up to nine with two en-suite showers/toilets. Full English breakfasts, hearty 3-course evening meals (optional), cold beers, good wine and dedicated chill-out barn with TV, music and games plus an outdoor swimming pool and sundeck. There is also secured garage parking, a drying room, workshop facilities and large motorcycle recovery trailer should the unforeseen occur. Located just north of Treignac, close to some of the best traffic-free twisties in the region. More than ten guided tours are available to locations such as Oradour-Sur-Glane, Rocamadour, Mont Dore, Puy Mary and Millau Bridge (tallest bridge in the world). They can also assist in route planning during your stay using RidersRest either as a base for exploring the region or for your onward journey to Spain, the Pyrenees, the south coast of France and the Alps. where: Le Theil, Treignac, 19260, Corrèze, Central Massif, Limousin, France. See here for directions. Périgord Limousin Natural Regional Park and within an easy ride to Limoges, Aquarium du Limousin and Périgueux. 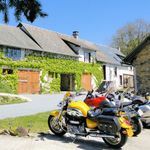 Biker Friendly Accommodation in France, Limousin, St Martin Terressus, just off the N145 La Souterraine to Guéret road, within the Creuse region and in the heart of the scenic Limousin, where local attractions include little-known châteaux, Oradour-sur-Glane, the towns of Aubusson and Limoges; famous respectively for tapestry and carpets and fine porcelain, markets and race circuits and very convenient for anyone heading for the south of France and Spain. The surrounding roads are magnificent for biking, with adrenalin-boosting twisters, fast straights and slow sweeping bends.Hotels, B&B, guest houses, cottages, hostels, camping. Ideal for touring! 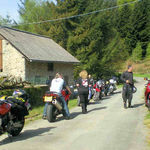 motorcycle tour in haute vienne, bikers welcome,in the heart of the Limousin. Located in the Millevaches en Limousin (Regional Nature Park), an amazing region full of green spaces, rivers, lakes and an ever-changing landscape. Countless attractions and activities are within a most enjoyable ride. Close to the lac de Vassivière - one of France's largest man-made reservoirs, with 45km of shores, 8 beaches, numerous water sports, horse riding, taxi-boats, mini-trains and its very own island which has Frances second largest collection of sculptures, the flowery meadow and a farm with animals. Within the hour to the Musée de la Résistance and the historical town of Limoges, the international porcelain capital. Place to see include Limoges-Bénédictins train station, St Etienne Cathedral and Les Halles open air markets, along with bustling cafe-bars and restaurants and/or even a little shopping. Situated between two National Parks, the Perigord and the Milleviches, just off the A20, Surrounded by beautiful scenery, gentle countryside, fantastic roads and a wealth of history to explore, such as Arnac Pompadour with its’ chateau, Uzerche, the moving village of Oradour sur Glane, Brive and Ségur-le-Château with beautiful medieval architecture. If you are in the area for a few days or heading on south this is an ideal place to stay, to discovery this beautiful part of the world.